Our Website, monthly Fayre, Gazette and Newsletters are extremely popular, here is an opportunity for you to become a Member and advertise with us. Aboutholistic.co.za started just over 12 years ago, and we have grown from strength to strength. Due to popular request, we are now extending our services. We have collected our mailing list from people that have attended our monthly Fayre, have never bought nor sold our mailing list; thereby only interested people view our newsletters. We are proud to announce that we have over 2000 people on our mailing list, with very high read and click rate - over 20%. Our Website has over 300 hits per day. These are very high figures for a specialized market and area. About Holistic is an online news and resource hub for the holistic and new age lifestyle. It welcomes like minded people in or across this influential sector a single point of contact for information, workshops, news and career opportunities. As a result About Holistic is perfectly positioned for advertisers to reach highly influential decision makers within a targeted sector. There is a number of different options available for you to advertise with us. Members are entitled to one page on the About Holistic website promoting yourself. You supply your logo, pictures and wording. Links to your email, blogs, etc will be included. Email sent to our mailing list of your services on an agreed upon date. Email will be forwarded to our mailing list on your behalf. We must receive your material 1 week before the date of sending mail. Payment must be made the latest 1 week before the date of sending mail. Cancellation of a newsletter can be made 1 week before the date of sending if not full payment will be due. 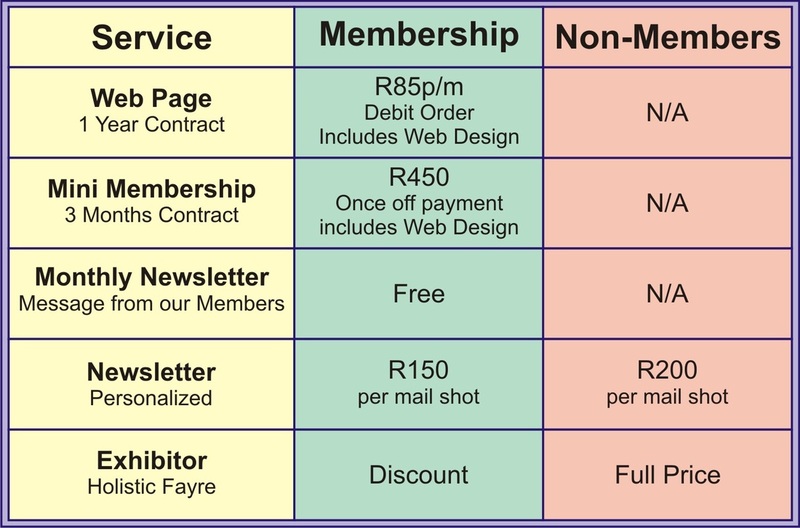 Gazettes and Newsletters are send out to people who have asked to be on our mailing list and mostly reside in the Northern Suburbs of Cape Town. A monthly Holistic Fayre is held at the Bothasig Hall, on the second Saturday of every month. The Fayre has become a household name and attendance has proved to be quality. The public has often commented on the positive energy they feel and absorb at the Fayre.